Olympus is carving itself out a hitherto largely untapped niche in the over-crowded compact market (unless you count Fuji's 'Big Job') namely that of tough point and shoots that are nigh on indestructible; its most recent product releases backed up by an entertaining TV and web ad campaign featuring a pint-sized menace. The latest metal-encased contender is the Mju 1030 SW (the suffix indicating that it's both 'shockproof' and 'waterproof'), which feels weighty enough in the palm to solicit a satisfying crack if you were to bounce it off anyone's skull. The allegedly scratchproof, mirrored metal front of the Olympus mju 1030 SW lends it a cool air of sophistication otherwise missing from its boxy, flight case-like design, with deliberately visible metal screws holding it all together. The choice of three sensible colours for the bolted-on face plate � platinum silver, midnight black or 'British' green, as on our review sample � help avoid the tackiness a wider palette may have introduced. With a manufacturer's asking price just shy of �320 in the UK, you're obviously paying a slight premium over similarly specified devices for the Mju's indestructible qualities � but for that you're getting a fairly unique product that will suit adventure sports fans as much as harassed mothers with curious-fingered tots. The headline features shout about the fact that the Olympus mju 1030 SW can withstand pressures of up to 100kg without being crushed, survive a dive to a depth of 10 metres (an optional waterproof case in the PT-043 available if you want to go deeper), is additionally shockproof if dropped from a height of up to two metres, and even freeze proof down to -10�c. The fact that it also boasts 10.1 million effective pixels is almost an afterthought. For starters there's that internally stacked 3.6x optical zoom mechanism (28-102mm in 35mm equivalent terms) that means that at no point does the lens protrude from the body. 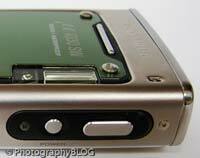 It's stored behind a protective brushed metal lens shield that snaps shut when not in use. While that's nothing special in itself � and there's no optical image stabilization in support � the ability to go as wide as 28mm makes the Olympus mju 1030 SW suitable for those on-the-slopes group shots, or getting the entire table in the shot clashing tankards during apr�s ski. In the absence of an optical viewfinder, you're totally reliant on the 230k dot resolution HyperCrystal II rear LCD. Though visibility of the 2.7-inch screen is at its best when utilized indoors, shot composition is still possible in bright spring sunlight, though our expenses wouldn't stretch to testing it in the white glare of fresh snow. Shooting range is 0.5 metres to infinity as the default, or from 0.1 metres in macro mode at the widest lens setting (super macro mode takes you closer still, enabling shots at 0.8-inches from your subject). Image storage is either onto the miniscule internal cache or removable xD-Picture Card � I was using a type-H 256MB card from Olympus � for which there is a slot at the camera's base shared with its new slim-line Li-50B lithium ion battery. Claimed to be good for up to 300 charges, and up to 260 shots at a time, a charger and adapter plug is also provided out of the box, as is an adapter enabling use of a microSD card, current favourite of the camera phone brigade. Other current must-haves such as face detection for perfectly focused people pictures, plus 24 hand holding scene modes further cement the impression of an undemanding, user friendly capture device. Of slightly more interest is a shadow adjustment feature that appears much the same as Nikon's D-lighting function, evening out exposures when the conditions would otherwise result in a bright background and deeply shadowed foreground. Build-wise, as we've noted, the square-ish Olympus mju 1030 SW looks at its best when viewed front on. There's a narrow window cut out of the faceplate to allow the flash bulb to peek through, the reflective surface a boon for taking self-portraits. The lens is part protected by a slightly raised surround that could only be referred to as a hood at a stretch. However the lens' positioning at the far top right of the body means that you'll have to watch for fingertips accidentally straying into the corner of the frame when gripping the camera with both hands. Keeping things simple, the gently curved top of the camera features only a nail-head sized power button next to a raised lozenge-shaped shutter release button. Press the power button and you're ready for a shot pretty much instantaneously, the rear LCD busting into life in a second. The shutter release has just enough spring to it to be able to quickly find the halfway point when setting up a shot, with an audible beep confirming focus/exposure has been determined. There's the opportunity to capture everything from 10 megapixel down to 640x480 quality JPEGs, with fine or normal levels of image compression offered, and even maximum resolution images are committed to memory in the blink of an eye. In auto everything mode, these are the only options the user has access to. 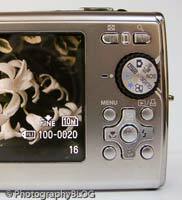 Though if you turn the rear mode wheel around to the second stills capture setting � program, denoted by the camera icon � and press the OK/function button at the centre of the four-way controller, you also get on-screen access to metering, single shot or continuous capture, manual adjustment of ISO plus white balance settings. Moving to the back of the camera, dominated by that aforementioned LCD monitor, we discover the Olympus mju 1030 SW's Achilles heel in the rather small, plastic and fiddly smattering of controls to its right. These don't match the build quality of the rest of the camera and feel like a carry over from a sub-�100 device, or indeed a cheap children's toy. Starting at the top of the back you get two small and narrow buttons for operating the zoom, which is reasonably responsive and quiet, though the mechanical action is audible. Below this is a small rotational mode dial that features settings for the aforementioned shooting and scene modes, plus digital anti shake, an on-screen operational function guide that provides handy prompts for beginners, video capture mode (VGA or QVGA quality options), and finally playback and separate 'my favourite' mode for shots you love. Directly beneath the mode dial is a four-way controller, with settings on its axis for selecting the close up mode/s, self timer (either off or on), flash (auto, red eye reduction, on or off) and exposure compensation (+/- 2EV), the latter of which � instead of the more usual slider � provides on screen real-time thumbnails of each incremental setting, so the user can choose which will deliver the best results. The various options are quickly and simply implemented by pressing the OK button at the control pad's centre. Above and below this are two sets of button pairs. The left of the top two is for the self-explanatory 'menu', which brings up the familiar Olympus Mju graphical interface with manual access to image size and compression level, along with the main camera menu divided into two folders, which repeats a lot of the essentials found by merely pressing the function button in whichever capture mode, plus camera set up (another four folders' worth of basic options, including alarm clock) and reset. Next to the menu button is a second one for recalling the last image displayed and/or activating the printing of a chosen image when the Olympus mju 1030 SW is connected up to a Pictbridge-enabled printer. The bottom pairing of buttons enable you to, starting with the button on the left, tab through the onscreen displays, which, apart from revealing the usual suspects (number of shots remaining, chosen compression level and resolution, ISO speed, capture and flash mode) or turning everything off so you have a clear view, calls up (with subsequent presses) a nine-zone compositional grid or a live histogram, so you can ensure an even exposure. In playback you also get capture data and a histogram. The last tiny button to the right of this is for turning on or off the aforementioned shadow adjustment feature � which we're glad to report does actually make a difference by boosting overall brightness � or deleting unwanted images. While the right hand flank of the camera � if viewed from the back � features a loop for attaching a wrist strap, and a covered compartment for the USB/AV port, beneath which is a built-in speaker, the left side is bare, save for its mirrored surface. This is the only part of the camera that visibly attracts fingerprints and smudges, with the exception of the LCD screen itself. At the bottom of the device there's a screw thread for mounting the camera on a tripod, alongside the previously flagged battery and media card compartment. Overall, operation is swift and the range of features on offer reveals that the Olympus mju 1030 SW is obviously aimed at the complete digital novice. We did try dropping the camera from desk height several times and it came back begging for more, with the disappointingly toy-like rear controls being the only obvious let down. But what of the images themselves? Do they deliver on the promise of the non-nonsense exterior or is their appearance similarly utalitarian? PhotographyBLOG is a member of the DIWA organisation. Our test results for the Olympus Mju 1030 SW have been submitted to DIWA for comparison with test results for different samples of the same camera model supplied by other DIWA member sites.